Most commercial DVDs will carry a region code when being released and sold in a specific region. The coding system specifies that a DVD released in a specific region can only be played on DVD players that carry the same region code. For example, most DVDs sold in North America have the region code of “1” on them, and can only be played on DVD players that have the same region code of “1”. 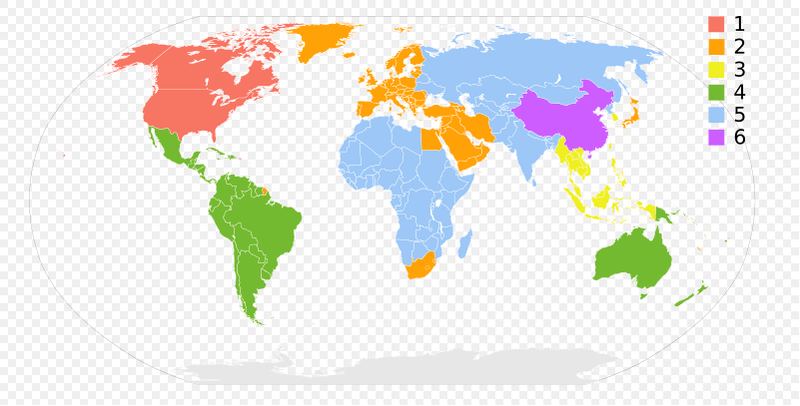 There are in total of 6 regions. Below is how they are divided. Some DVD players are manufactured with no region codes on them. Such kind of DVD players is also commercially available to consumers. A region-free DVD player is able to play DVDs of all regions. If you have a region-free DVD player, then you can basically play all kinds of DVDs you want, no matter where the DVD’s released in and what region codes are on them. Some people might have DVDs purchased in a foreign country, and the DVD is probably encoded with a region code different from the one on their DVD player. In a case like this when the region code on the DVD disc doesn’t match the one on the DVD player, the player won’t be able to play the disc. If you have a region-free DVD player, you won’t be bothered by the region codes as your DVD player would be able to play any DVD disc you can possibly throw at it. Check out the top 5 region-free DVD players you can buy to play DVDs of all regions and avoid region code issues. 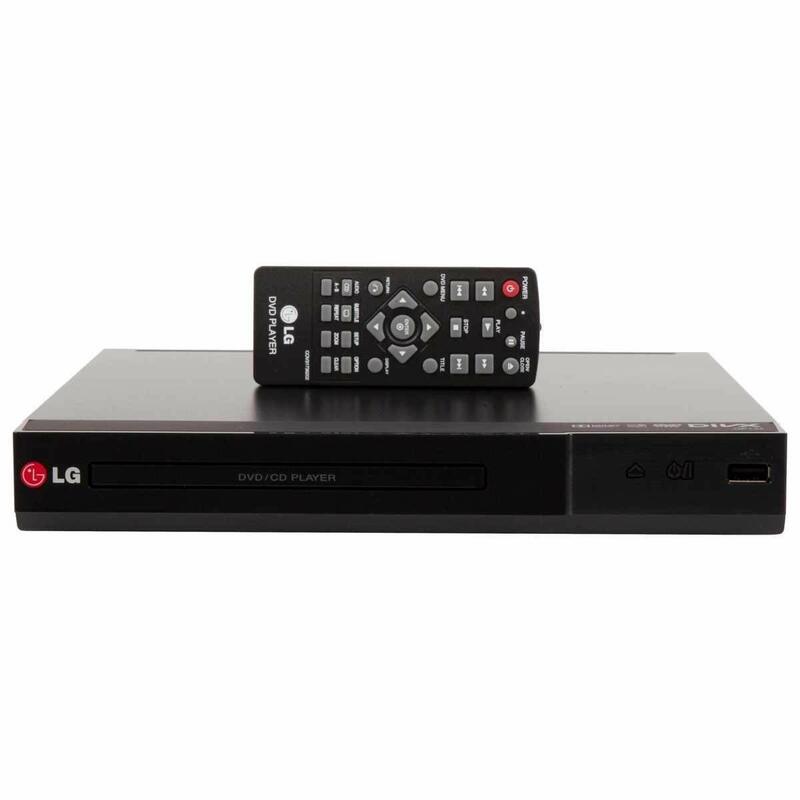 The LG DP132 is a region-free DVD player that can play DVDS of region 0123456. Aside from that feature, it can also play JPEG, MP4 and DivX files directly from a USB storage device. It also has a useful feature which helps you extract audio from CDs to USB storage device. It’s a pretty useful feature if you have some CDs you want to turn into digital files and listen to the music on your phone. The only flaw is its lack of support for HD upscaling. The Panasonic DVD-S700EP-K is region free and supports both PAL and NTSC DVDs. It’s compatible with all kinds of DVD discs, like DVD-R*/DVD-R DL*/DVD-RW*, +R*/ +R DL*/ +RW*, MP3, JPEG,CD, CD-R/-RW, Xvid, SVCD. It also has the CD Ripping feature which allows you to rip the CD music to MP3. Most importantly, it supports 1080p up-conversion. It’s capable of upscaling standard definition content to near 720p, 1080i and 1080p resolution using HDMI output. It’s an extremely useful feature considering how common 1080P TVs are right now. It’ll make watching DVDs on HD or even FHD TVs much more enjoyable. It also has a USB port that allows you to connect a USB drive to it and play the JPEG and MP3 files on it. The Panasonic DVD-S500P-K basically packs some basic features. First of all, it’s region-free and it plays DVDs of PAL NTSC from region 0123456789. It also plays common CDs, and media files from USB drives like MP3, JPEG, and DivX. It doesn’t come with some of the useful features you can find from other region-free DVD players but it does have a lower price tag. 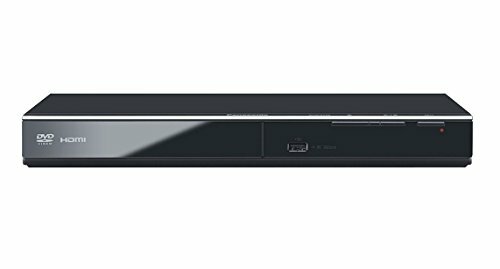 You can get it for $47 so if you don’t want to spend too much money on a region-free DVD player, this is the one to go. 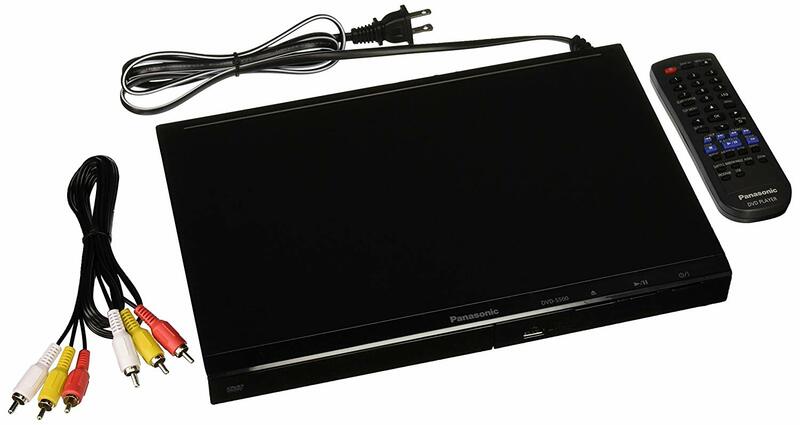 The Pioneer DV-3052 DVD player can play both PAL and NTSC DVDs of all regions. And while playing the DVD, it can upscale the DVD image to up to 1080P. It’ll make the playback of your DVDs on 1080P TV much more enjoyable as it can provide clearer image than DVD players that don’t support 1080P upscaling. It can also improve the audio quality of a compressed audio file, which is interesting and useful as most of the MP3 we listen to is compressed. 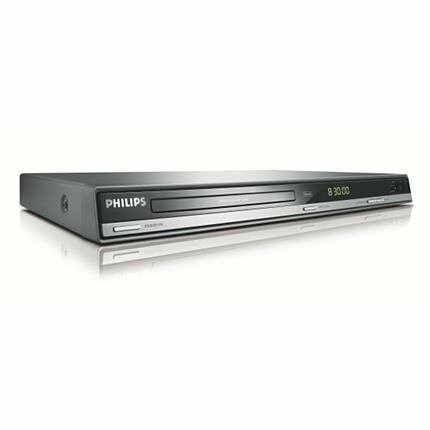 The Philips DVP 3550K plays DVDs of all regions. It’s a standard region-free DVD player that can be used worldwide to play all kinds of DVDs. It can also read and play media files including JPEG, MP3 and DivX from USB drives. But the lack of 1080P upscaling makes it a little less attractive than its competitors. Above are several high-quality region-free DVD players you can buy. They are all around $50. If you have collected a certain amount of DVDs from different regions, get one of the above region-free DVD players and enjoy them without having to worry about the region codes standing in your way. If you have no planning on getting a new DVD player but still want to watch a DVD disc that you can’t play with your current DVD player, there’s another solution you can have other than getting a region-free DVD player. Try making a region-free copy of the DVD disc you can’t play. Just like you can use a region-free DVD player to play DVDs of any region, you can also play a region-free DVD disc on any region-locked DVD player. To make a high-quality region-free DVD copy, Leawo DVD Copy is one of the best choices you can have. It’s equipped with the ability to create 1:1 lossless DVD copies. And it can remove the copy protection and region code on the original DVD and create a copy that you can play on any PC and DVD players. You can also use it to compress DVD-9 to DVD-5 when needed. If you want to make a copy with no quality loss, this is the right program to get. ☉ Capable of performing 1:1 lossless DVD copying. ☉ Copies DVDs to hard drives and blank DVD discs. ☉ Intuitive and easy-to-use interface. The instructions for using Leawo DVD Copy to make region-free DVD copies are shown in the content below. You might not find the shortcut icon of Leawo DVD Copy after installing it on your computer. That’s because it’s not a single piece of software but a module included in a software suite that’s called Leawo Prof.Media. The shortcut icon is hidden inside Prof.Media’s main interface. Open Prof.Media and there will be in total of 8 tabs on it. Click the DVD Copy tab to open Leawo DVD Copy. 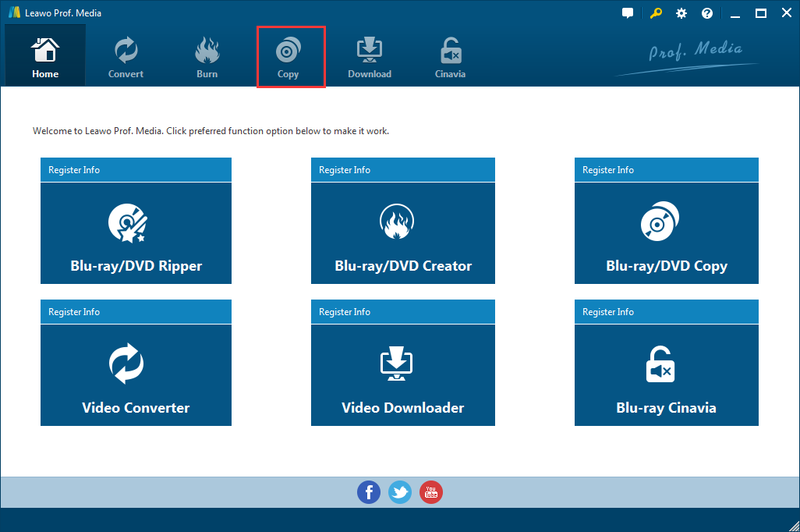 If the disc’s been inserted in your DVD drive, you should be able to import it to the program directly by clicking Add Blu-ray/DVD>Add from CD-ROM. Also, like most of other programs, it supports drag-n-drop, you can directly drag the DVD folder to DVD Copy’s interface to add the data in the disc to the program. 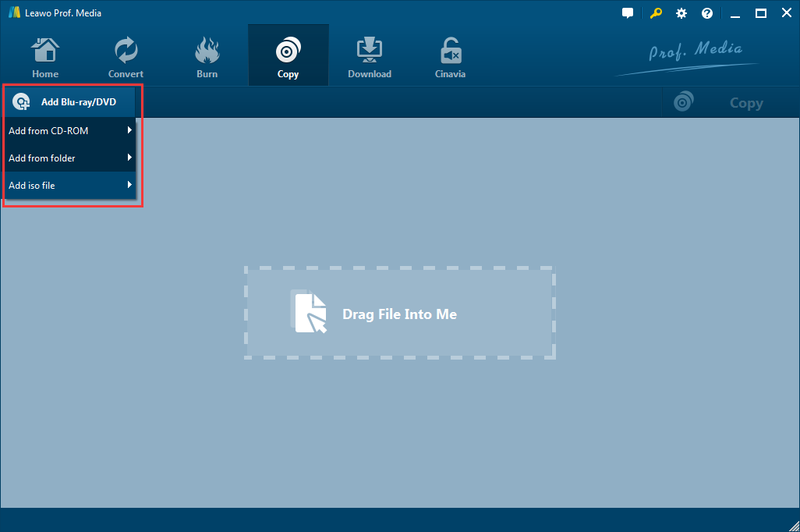 In this step you are provided 3 copy modes which help you to quickly pick different content in the disc to save in the copy. Here’s what they do: Full Movie selects all the content. Main Movie will only select the longest video to save in the copy. Custom Mode allows you to select videos, audio tracks and subtitles by youself. You will also need to select the disc format for the copy. There are typically two formats: DVD-9 and DVD-5. You can select one according to the format of the original disc. You can do DVD-9 to DVD-9 copying as well as DVD-9 to DVD-5 compression. The Format button can be found in the bottom left-hand corner. In the upper right-hand area, you should see a Copy button. Click on it to display a sidebar. On the top area of the sidebar there are 3 options. You can check DVD Folder to copy the DVD folder to your hard drive or check ISO file to convert the DVD folder to an ISO file and save it to your hard drive. If you have another DVD drive and it can burn DVDs, you can connect it to your computer, put a recordable DVD disc in it and select it from the drop-down menu of the third option to directly copy the original disc to the recordable disc. Click the Copy button below to start copying. The copy you create won’t have the region code from the original disc. Note: Leawo DVD Copy can also help you burn the DVD folder or the ISO image you got to a recordable disc as well. So when you don’t have a spare DVD burner, you will still be able to copy a DVD disc to another disc. Just drag the DVD folder or the ISO file to the program and repeat Step 3 and Step 4 to burn them to a recordable disc and create a region-free copy. 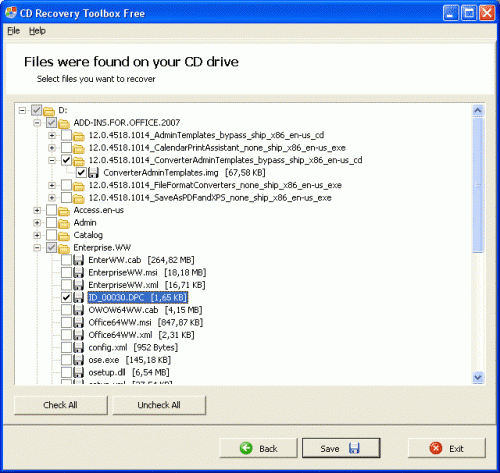 If you have a DVD with severe scratches on it, try using CD Recovery Toolbox to recover the damaged data on it. It might not 100% work if the damage is too severe but it’s been proven by a lot of users that it can recover the data they need most of the time. Here’s how to use the program to recover damaged data from the disc. 1. Put the scratched disc in your disc drive. 2. Download, install and run CD Recovery Toolbox on your computer. 3. Select your disc on the interface, find the data you want to recover and check all of them. You can also choose to recover the whole disc. 4. Set where to save the recovered data. 5. Click Next to start recovering. The program can work with most CD/DVDs but I’m not sure if it can work with Blu-rays. If you have some Blu-ray movies you like, I would suggest that you back up your Blu-ray collection before anything bad happens.